Situated on Jumeriah Beach, overlooking a 238-berth marina full of luxury yachts and leisure craft, the Westin Dubai Mina Seyahi was the first resort hotel in the area to have its own private beach, and today has a coveted Blue Flag award for quality. There are plenty of ways to enjoy the warm Gulf waters. The resort’s water sports centre can get you water-skiing, windsurfing, kayaking or you can learn to sail on a Hobie Cat or Laser sailing dinghy. You can also hire your own yacht, powerboat, or be taken on a tour of the local coastline. On land, there are floodlit tennis courts, daily beach games, golf courses nearby and an outdoor heated pool. 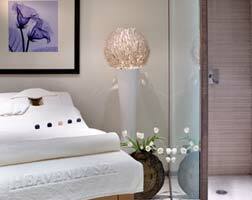 Relax and unwind at the Heavenly Spa by Westin, in an opulent yet thoroughly modern atmosphere. Eleven spa treatment rooms, with separate male/female relaxation areas, luxurious couples ‘rooms, steam-rooms, saunas and jacuzzis are all part of the pleasure you’ll experience. Choose from 14 different massages and reflexology treatments, six different body treatments, and a host of facials for both men and women. Whilst parents unwind, the kids (4-12 yrs) can have maximum fun in the seven-day-a-week Penguin Kids’ Club. Games and activities include daily beach fun, with special menus to keep them well fed. Babysitting is available too. There’s plenty of activity for the older ages in the Westin Workout Gym. Sleek, airy and full of all the little details that make working out less of a sweat, you can enjoy Pilates and yoga classes too. A nice touch: a free pair of brand new New Balance athletic shoes for guests, one less thing to pack. Worked up an appetite, or thirst? The Westin Westin Dubai Mina Seyahi takes a very entertaining approach to wining and dining. Seven restaurants and bars offer a ‘round-the-world’ taste of cuisines, as well as live cooking and open kitchens to satisfy all the senses. For meetings, both business and social, the hotel has all you might wish for. There’s a total of 15,600 square feet of meeting and entertainment space, for groups from two, all the way up to 1500 people. The Italian-designed conference centre has nine meeting and conference venues, including a large ballroom for up to 1200 guests. A unique outdoor beach amphitheatre can provide an extra special venue for up to 1500.